To maintain the highest print quality, you need to clean your print-head every time you change ribbon or label stock. Adhere carries three different types of print-head cleaning supplies. Easy to use cleaning cloth, cleaning card or cleaning pen. ribbon breakage, smearing text, poor print quality or too dark or too light of print or barcodes that are out of specification? You may need to adjust your heat and speed settings. Lower heat settings are required for printing on paper with a wax ribbon. While much higher heat settings are required for printing on film with a resin ribbon. Running too high of heat setting can wear on your print-head. Refer to user manual for suggestions from the printer manufacturer. 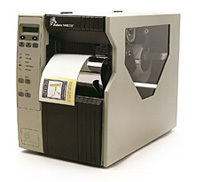 Adhere Label Products offers a wide selection of high performance label printers from the industries top printer manufactures. We'll help you find the right printer for your application and budget. We will also make sure you have the right combination of printer, software, labels and ribbons to make your label printing operation a complete success. Our software partners keep the user in mind when they develop their label packages. With their Windows like appearance if you are familiar with today’s office applications, then you’ll find our software packages “easy” to use. Whether you need to print barcodes, graphics, text, images, or maybe you need to print from a database. 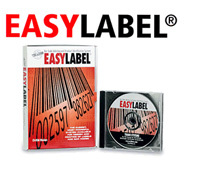 With several package options available, we have the software program that is right for your label application. Call us at 800-952-2821 or email us to receive a free software demo and literature. Time is critical if your equipment breaks down. 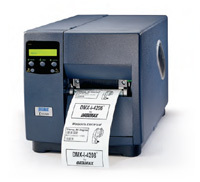 That is why as a single source supplier we offer a variety of service options for your label printer. We also carry a complete selection of replacement print-heads and printer parts. Most parts are available to ship the same day. Be sure to have your printer model number and serial number available when you call or email us for a quote.